There are several reasons why we haven’t been testing for the last three years… after her February 2010 tests, she had babies then the next time testing came around, she was in heat. Then again in heat. Then I lost my job so funds for additonal training and testing went out the window. Then she had babies again, then she was in heat again. 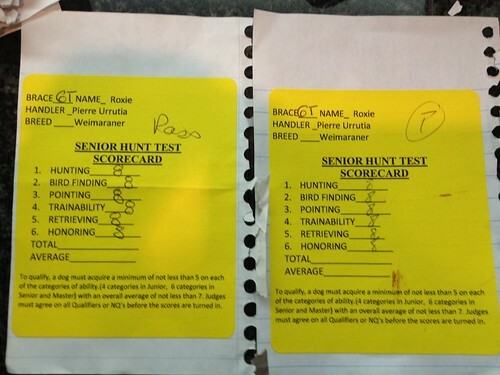 Roxie had been regressing in her training a bit as was evident while hunting last fall. She needed more training and practice that I had opportunity to give. I would have liked to go back to our usual trainer but in order to finish her testing, she needed more specialized training. 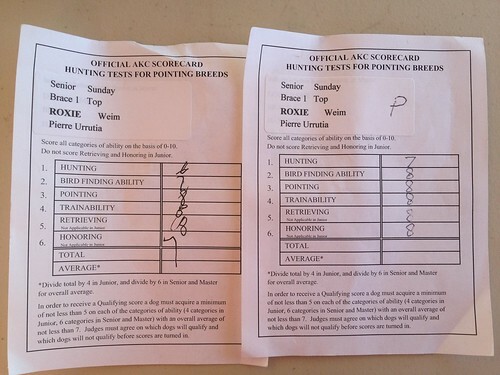 So I opted for a trainer that was experienced in these tests and who could work with her on what she was lacking. So, I dropped her off on December 30th for six weeks of training. I’ve missed her so much!!! 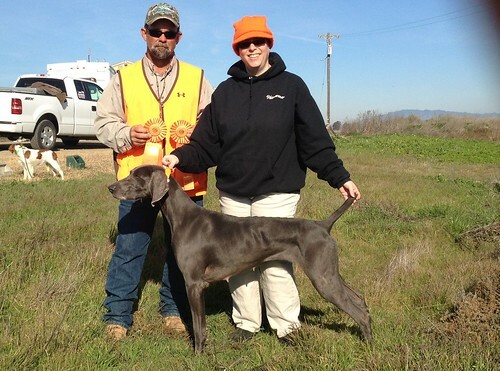 So, it started last weekend (Feb 2 & 3rd) at the SFBWC hunt test at Quail Point Hunt Club. 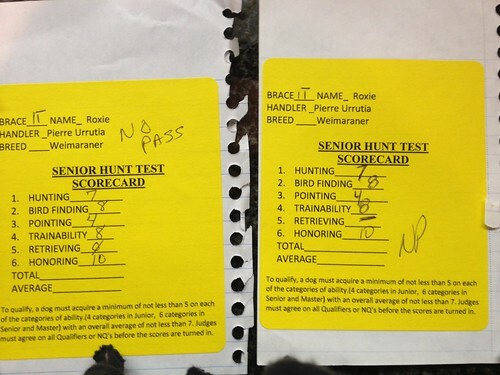 She had earned one leg pf Senior Hunter back in 2010 and needed three more to earn her title. During the week, Pierre worked on her relocating and no matter where they were training, how and where he touched her to release her, she stood steady every time. This is a problem I have repeatedly had with her in the past. She does very well in training but when it comes test time, she seems to forget what she’s supposed to do. There are humans out there with the same problem. You know the material, but are poor test takers. That’s my Roxie! Fast forward to this last weekend, Feb 9 & 10. 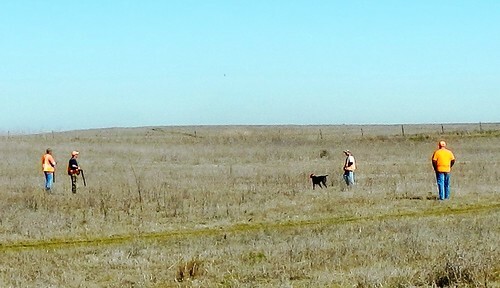 The Golden State English Setter Fanciers hunt test at Grizzly Island. Due to the test location, I was able to walk to the bird field and hide behind the trucks to watch and video Roxie’s test. I’m so proud of my girl. I knew she could do it, she just needed a stronger handler to get her through it. So what’s next? Couch time, running partner and hunting partner. Oh and mommy one last time. 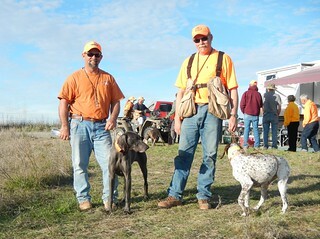 Special thanks to Pierre Urrutia of Diamond P Gundogs for helping her over the last three hurdles of earning her SH title. 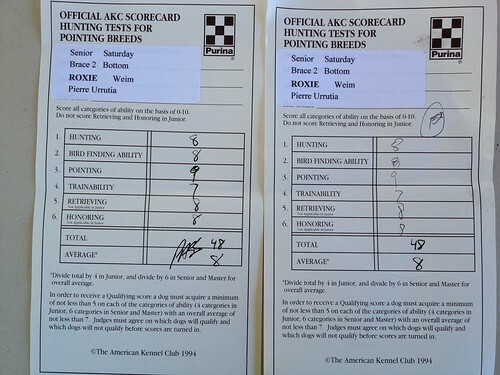 Also, I want to be sure to recognize that Roxie had a strong foundation of training by Brad Higgins of Higgins Gundogs.